A wedding, a birth, an important event or, more simply, a personal photo book: the most precious moments of our lives stay in our heart, together with our loved ones. With time, however, the memories of those intense moments fade slowly and the details are lost, flying far away. Relying on a professional photographer means capturing the true essence of those moments and bring it on paper: immortalize a smile, a gesture, and/or a detail that will remain within us forever. Nowadays the Web is full of freelance photographers with little experience or, even worse, of amateurs who pretend to be experts on photography and photographic techniques in general. Let’s learn to identify a successful professional photographer best suited for our needs through five simple guidelines. Many people believe that the higher is the cachet of a photographer the greater are his/her skills. This rule, although valid, is not always true. Indeed, we can find several emerging photographers with passion, but, above all, with great talent. These “aspiring professionals” offer very low and competitive prices to launch their business. Before hiring someone, however, it is highly recommended to check some of his/her work. This will also help us to understand if the style of the photographer meets our expectations. This point is as true as risky. We had a chance to see many people who pretend to be good photographers, and offer wedding services at a very low price or almost free (or even free). We should be very careful as it is very easy to fall into a trap and get pictures of a one-time event to trash. We have seen that many “photographers”, some of which have their own booth at the exhibitions of photography, weddings, etc., advertise their services showing stolen photographs or purchased in stocks, which are obviously made and signed by other photographers. People believing that this company takes good photos, like the ones they have in leaflets, in albums or on their website, buy their services, which often have good prices, but then they get disappointed once they received the photographs they paid for. Look out! When we hire a photographer we actually become employers. For this very reason it is both our right and our duty to check in advance the curriculum vitae of who we are going to engage in order to avoid unpleasant surprises. 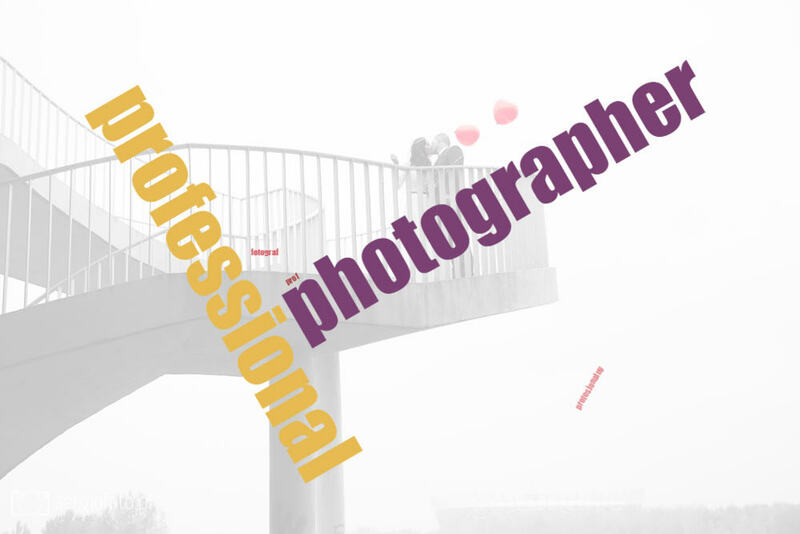 A professional photographer, worthy of the name, should usually possess certificates and qualifications from graduate schools. Alternatively, he/she should have worked as an apprentice with other professionals and/or photo agencies. Also this one is a guideline with exceptions. There are many photographers that left their jobs in corporations in order to turn their part time job, into full time job. And at the same time there are many photographers that graduated in a photography school, ended many courses, attended many shows and workshops, but their photos stink (that’s a technical term btw.). Hence what is highly suggested is to look at their portfolio and see if what they do, as long as they are the real authors, meets our expectations. When we talk about photography, having talent is not enough: a great shot is a clever combination of details, taste and technique. To realize their masterpieces, the professional photographers use special equipment. The cameras are often full frame Digital Single Lens Reflex, top of the line 35mm . In general, the professional continuously reinvests on his/her work by always providing customers with the best equipment possible. It’s worth to highlight here that a good photographer is capable of making good quality photos even with low quality equipment, but he needs time and preparation for it, and the outcome is usually artistic photography. During reportage photoshoots (weddings, etc) there is not enough time to think – the photographers must act and catch the most important moments in the best way, and here it is indispensable to have the right equilibrium between good equipment, photographer’s experience, and good taste of the photographer. If we have to choose a photographer with good or not good equipment, we rather go for the photographer with expensive and professional equipment, because the risk to get crap is too high and it’s not worth the candle. The first approach with a potential photographer usually takes place through his/her website. It is our duty to carefully check the entire portfolio by particularly focusing on the style of the artist. If his style meets our sense of taste, we can proceed to examine his/her cachet. The third, most important, step is to meet the photographer or, alternatively, call him/her. A true professional photographer knows that every customer is important and deserves the best. Photographers not willing to listen to our demands should be distrusted. Remember: a photo without passion is “dumb” and worthless. This however does not mean that the customer must give the photographer special rules on how to photograph, because the photographer is an artist and works under inspiration and circumstances. Of course if we want an album fully black and white, or we don’t like cold color photos, or warm colors, we can say it and the photographer will take it into account. You never stop learning: this old saying finds its major application in the field of photography. Even if well-experienced, every professional photographer uses constructively his/her time by attending numerous training courses, workshops, fairs and exhibitions. These events offer the artist a chance to meet with other colleagues, expand their horizons, find new sources of inspiration, and, above all, improve their technical skills.